Today: Are you a Black Belt in the Energy Blades 101 Class? 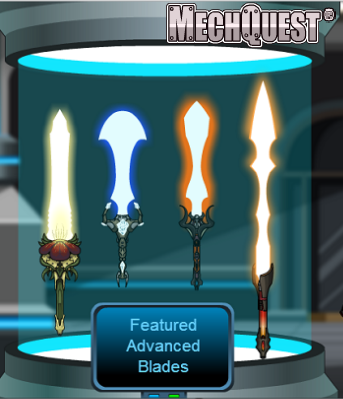 Go to Light's Sabers shop in Soluna City East to see the new shipment! Blade and Zoshi, our two new apprentice artists, have begun putting together an awesome new series of Energy Blades! These are permanent in-game items for the students who have achieved Black Belt ranking, and we've got plans to add more designs & themes as time goes on. March of the Shadowscythe WAR! Hurry back to the War Camp to catch up if you are not yet up to date with the latest events of the war, and prepare yourself for the epic conclusion of this massive conflict. Be sure to check back this upcoming Friday for the spectacular climax! A plan for the future... or is it the past? Or some kind of wild alternate timeline? Heya everyone, Plasma Charge here! As you all know the final battle between the Allies and the Shadowscythe is almost here, and from looking on the forums there seems to be quite a bit of confusion as to the state of the game after the finale of the main storyline. As such to put your minds to rest I'm happy to announce the location of the next planned saga of MechQuest; The next saga will take place on the planet Gark focusing on the Westian settlement! The basic bones of this saga have been in my mind for over a year now, and with the help of Maegwyn and other team members (past and present) it will be solidifying over **the next few weeks! Hope you're all well, and best of luck in the battle ahead! **We'll be busy polishing & refining, and will bring it to you Live when it's ready!